Did you know that Guinness and oysters is one of the oldest food pairings in the world. The first recorded mention of this dynamic duo is from 1837! So you have to believe me when I say that my Guinness Oysters Kilpatrick are perfect. Truth is that these two make a mighty fine couple because they compliment each other on the palate. Oysters have a raw, briney & salty flavor that makes them good when eaten right from the ocean or even cooked right on top of the coals. Guinness is malty, subtly sweet and creamy. These two combined complete a full range of flavor in my Guinness Oysters Kilpatrick recipe. Also try my Beer Glazed Scallops for similar flavor! YOU READY FOR GUINNESS OYSTERS KILPATRICK? 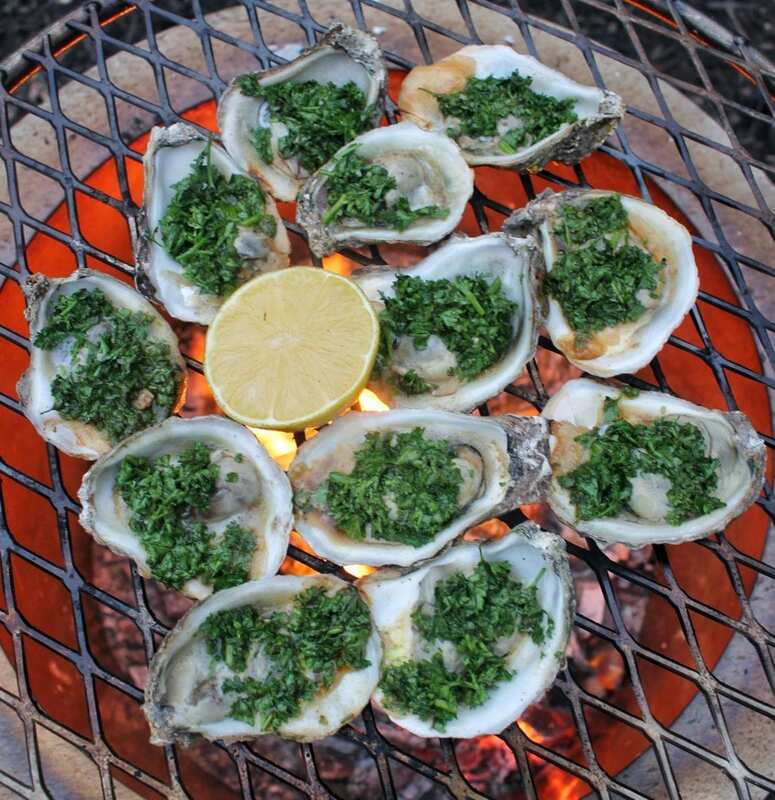 This recipe is a twist on grilling oysters over fire. While some might prefer oysters uncooked, I think that this recipe will open their minds. Packed with a zesty and herbal sauce, these Guinness Oysters Kilpatrick are grilled over the fire and then topped with Irish cheddar & bacon. What is not to love about that? Lastly, you just need to pour yourself a pint of Guinness and grab some lemon wedges. 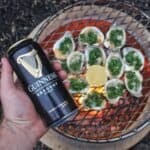 I even add a little bit more hot sauce on top of my Guinness Oysters Kilpatrick since the Guinness will help wash the heat down. All in all, this is an awesome backyard Irish recipe. Great for cooking any time of the year! Try these Guinness Oysters Kilpatrick this holiday season as an appetizer at your party or maybe the main dish. You will not be disappointed. 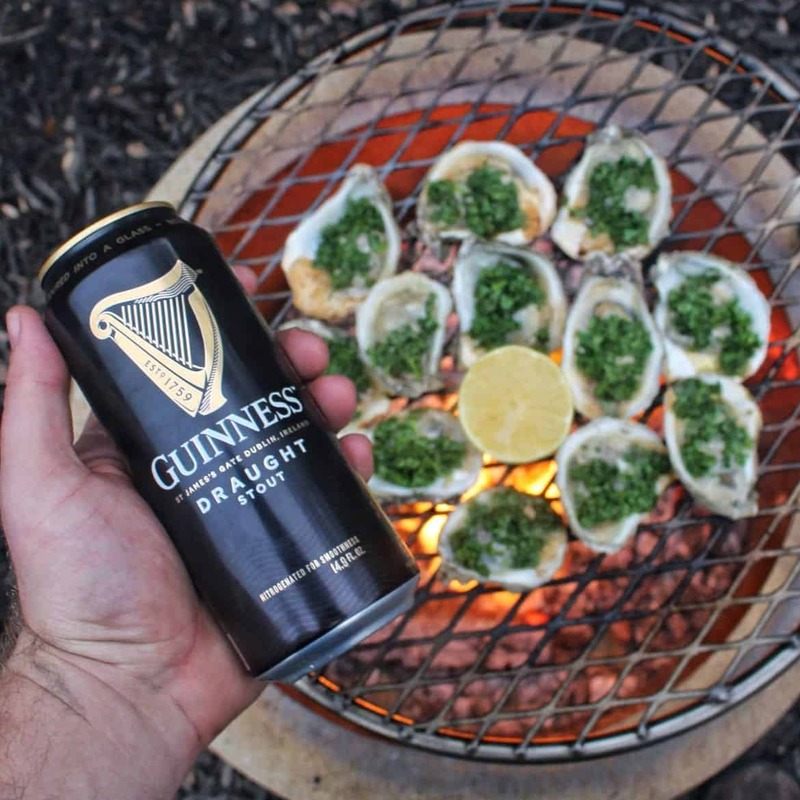 Make some delicious oysters with Guinness over the fire with this recipe. 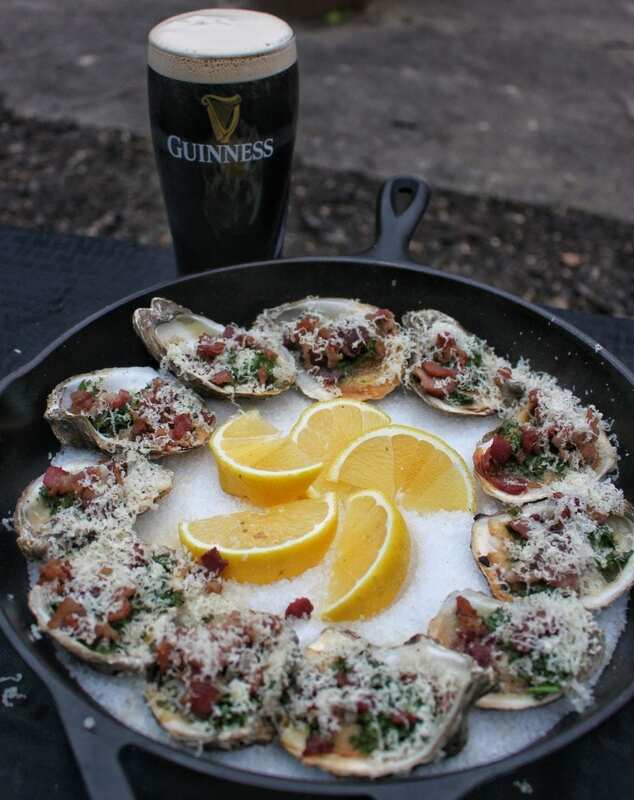 Try my Guinness Oysters Kilpatrick recipe below for some savory and salty seafood. In a bowl, mix all of the oyster sauce ingredients (except for bacon & Irish cheddar). Set aside. Build a medium-high heat fire for direct grilling. Add cast iron skillet to fire 1 minute before cooking to pre-heat. Cook bacon in skillet until done and put aside. Add oyster sauce to the top of the shucked oysters, and place them over the fire. Cook for 2-3 minutes or until they begin to bubble. Pull off the grill immediately once done. Top cooked oysters with bacon and shredded Irish cheddar. Pour a glass of Guinness into your pint glass and enjoy! Equipment Needed: Guinness pint glass, cutting board, oyster shucking knife, knife, wood and tongs.